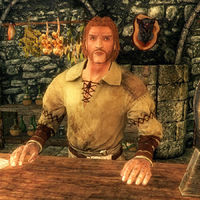 "If you need a good rumor or two, I think I can oblige..."
The innkeepers of Skyrim, in addition to providing food, drink, and beds, also offer rumors to interested parties. Innocence Lost has not been completed. Initiates Innocence Lost as a miscellaneous quest. "I heard tell of a lad in Windhelm. Aventus Aretino. They say he's been doing the Black Sacrament, trying to contact the Dark Brotherhood. Damn fool." Any male innkeeper Innocence Lost has not been completed. Initiates Innocence Lost as a miscellaneous quest. "Been talk of a little boy in Windhelm, name of Aventus Aretino. Get this - he's been trying to contact the Dark Brotherhood. Foolish lad..." Any female innkeeper Innocence Lost has not been completed. Initiates Innocence Lost as a miscellaneous quest. "There have been whispers. A boy, up in Windhelm, name of Aventus Aretino. Been trying to contact... the Dark Brotherhood." Orgnar Innocence Lost has not been completed. Initiates Innocence Lost as a miscellaneous quest. "I was walking by the old Aretino Residence, heard the little boy, Aventus? He was chanting. It was the Black Sacrament, I tell ya." Ambarys Rendar Innocence Lost has not been completed. Initiates Innocence Lost as a miscellaneous quest. "Hear about the little Imperial boy, Aventus Aretino? The stupid whelp is trying to contact the Dark Brotherhood..." Malthyr Elenil Ambarys Rendar has died, Malthyr Elenil has taken over the New Gnisis Cornerclub, and Innocence Lost has not been completed. Initiates Innocence Lost as a miscellaneous quest. "Folk been hearing some strange stuff coming from the Aretino place. Chanting. Talk is, little Aventus is trying to contact the Dark Brotherhood..." Elda Early-Dawn Innocence Lost has not been completed. Initiates Innocence Lost as a miscellaneous quest. "A little boy, Aventus Aretino, got sent to the orphanage. Now there's talk he's trying to contact the Dark Brotherhood. No good can come of that..." Nils Elda Early-Dawn has died, Nils has taken over Candlehearth Hall, and Innocence Lost has not been completed. Initiates Innocence Lost as a miscellaneous quest. "Have you seen that Shrine of Azura? They say the dark elves built it after they fled from Morrowind. Sight to see." Any innkeeper None Marks the Shrine of Azura on your map and initiates The Black Star as a miscellaneous quest. "They say Falion of Morthal has studied vampires, draugr and all matter of undead." Any innkeeper You must be a vampire. Begins Rising at Dawn. "They say a dragon attacked Helgen. Sounds like hogwash to me." Delphine or Orgnar Before the Storm has not been completed. "We've got something of a love triangle here in Riverwood. Faendal and Sven, both vying for Camilla's affections." This page was last modified on 4 January 2019, at 21:24.